Aside from being an actress and a girlfriend to Dingdong Dantes, Marian Rivera is also a dedicated kitchen diva. She loves to cook and has already mastered some recipes, but she plans on improving her skills by taking a formal culinary course. 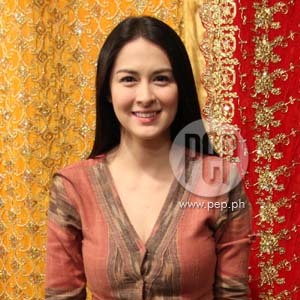 Kapuso star Marian Rivera has a bit of a dilemma. How can she can focus on her hobby—cooking—if she's not going to have any break after Amaya? A few weeks after her last taping day for the epic serye, she is set to start working My Beloved, her reunion project with real-life sweetheart Dingdong Dantes. How can she find time for classes in a culinary school? "Bahala na kung paano ko aayusin yung schedule ko para magawa ko pa rin 'yon," she told PEP (Philippine Entertainment Portal) on January 6 at the Amaya's sound stage in Marilao, Bulacan. The 27-year old actress revealed that cooking as been her passion. "Mahilig kasi ako magluto," she says. "Tapos nag-aral ako mag-bake sa sarili ko through books. "So gusto kong pumasok sa school. Hindi basta one-day lang, ha, gusto ko school talaga." She prefers to undergo a full-time program than a crash course, which she can finish in a couple of days. "Kasi doon sa school lahat ituturo nila, e. Kahit gusto ko o ayaw ko, lahat ng proseso nila ituturo nila sa'yo." From proper food preparation to knife handling techniques and other kitchen skills; Marian is very eager to learn the ins and outs of cooking. "Gusto ko kasing palawakin yung nalalaman ko. "Kasi marami akong alam [na lutuin] pero wala akong alam na ibang twist na puwedeng gawin sa pagkain." While she has mastered her Beef Caldereta and Carrot Cake recipes—the most requested dishes of her family and friends—Marian still wants to explore other cuisines. She also hopes to put up a restaurant in the future. Her parting shot: "Hindi naman sa ngayon pero sana, malay mo after 20 years, bilang magaling na magaling na akong magluto, bakit hindi, 'di ba?"